A family-owned river cruise line that focuses on service and luxury, AmaWaterways ships ply the rivers of Europe, Africa, and Asia and also lead passengers on themed specialty cruises. Even when docked among ships from competing companies, AmaWaterways vessels, with their graceful lines and nearly stem-to-stern balconies, stand out. Measuring approximately 444 feet long, AmaCerto, which first went to sea in 2012, accommodates just 164 passengers, who will be fed and cosseted. Couples who like touring romantic cities and reveling in the scents and brilliance of flowers in bloom may enjoy the company's Tulip Time Cruise, which is available in springtime and sails through the Netherlands and Belgium. Twin-balcony cabins on AmaCerto provide couples with a place to relax in private and savor the slowly passing scenery (when sailing in still and deep water, the ship covers approximately 15 miles per hour). Although tiny, the outside balcony accommodates two chairs and a table wedged together. The French balcony affords views through a double door. The mattress is dressed in white linen with pillows piled three high, and passengers can request cushy feather pillows to replace standard ones. Modern bathrooms are clad in white marble with brown mosaic accents. A shower, with both a rain spout and a handheld spray, is provided. Thoughtful touches include grab bars in the shower and a makeup mirror with a magnified side. All that's missing is a night light. The in-room screen offers a few TV channels of the CNN/BBC/Sky TV variety and current and classic movies. Toggle the remote control to switch the screen to the Internet. A keyboard and mouse are provided. Wi-fi is complimentary but leans toward slow and hinky when the ship is not in port. A safe and mini-fridge are provided, and stewards provide bottled water daily, twice-daily cleaning, and chocolates on pillows. AmaWaterways is the only river cruise line to belong to Chaîne des Rôtisseurs, a gastronomic society that prides itself on maintaining the traditions of French cuisine. AmaCerto has one large main dining room, where breakfast, lunch, and dinner are served. Most sections contain four-tops, and there are a few larger round and oval tables. There are no two-tops, which means that it's likely you'll end up meeting and conversing with fellow passengers at meals. Appetizers are available buffet style, and a multi-course menu is also provided for each meal. Fresh fruit and a selection of fine cheeses are available every day. Having eaten in the room for a week, we found and stuck to our favorites: For breakfast: fresh bagels, cream cheese, and smoked salmon plus a glass of orange juice were a treat we did not tire from. Nonetheless, an omelet cook stood at the ready and every day a different special, such as blueberry pancakes, was offered. At lunch, although we were often tempted by daily-changing choices, we usually opted for a steak sandwich with onions and a side of fries that arrived in a miniature fryer basket. Dinner offered a selection of tasty soups. A make-your-own salad bar was available and caesar salad — complete with a slice of bacon! — could be summoned from the kitchen. Fish and beef entrées prevailed. The ship also contains an intimate, 27-seat Chef's Table restaurant at the stern, where the same menu is served for a week; each passenger is entitled to one dinner in this spot. On our sailing, it began with an amuse bouche of three small cubes of chicken drizzled with teriyaki sauce; truthfully, it didn't seem a sophisticated offering. It was followed by an appetizer of three thick pieces of cured salmon. Most in our group then opted for a tenderloin covered with goose sauce. Dessert was the exceptional part of the meal. It delighted with a miniature shot glass filled with what tasted like a napoleon, a scoop of mango ice cream, and a small but perfect chocolate tart pricked with a spun sugar straw. Each meal, including breakfast, had sweet endings available. The morning buffet table usually bore a frosted donut along with minature pastries. At lunch and dinner three ice creams, different flavors each day, were scooped by a staffer. Diners could avail themselves of a variety of toppings, including fudge and marashino cherries. Anticipating our arrival in Belgium, one night's dessert was a chocolate buffet. It was resplendent with cakes and puddings, miniature eclairs and pralines, chocolate-dipped strawberries and more. A vegan was traveling with our group. Although the restaurant accommodated her at every meal, we couldn't help pitying someone who insisted on depriving herself of this bounty. Don't count on 24/7 action on the Tulip Time cruise. There's no loud music, no hourly announcements, no drunken sail-aways, no casino, and no sea days — since the ship makes daily port calls. 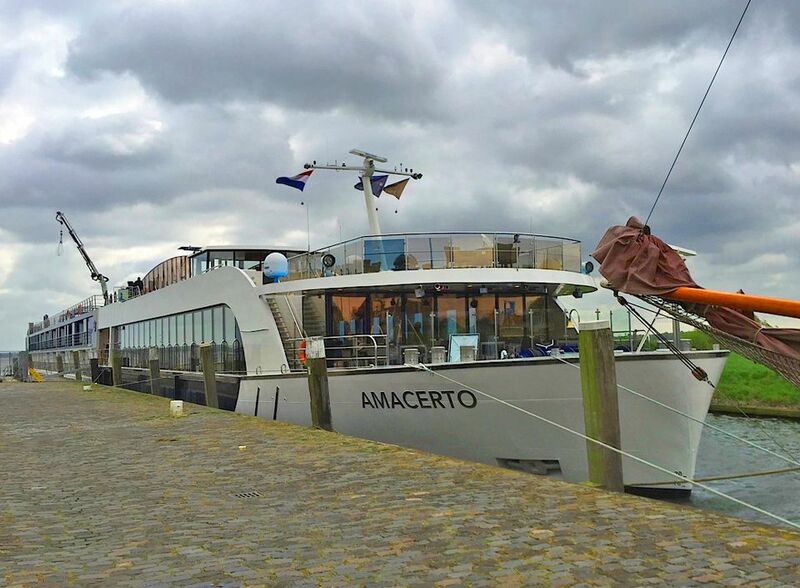 AmaCerto does have a small, heated swimming pool on its Sun Deck, an uncommon feature on river cruise ships. AmaCerto also contains a small workout room and offers the services of a masseuse and a hairdresser. A small, pass-through area off the lobby is designated the Game Room. It has some comfy chairs and couches and two gas fireplaces. The lounge, a magnet for readers, always has beverages and cookies available. Entertainment is limited: At times there was a piano player. One night a singer performed. On another, a small jazz group with an off-key saxophone player made us grateful that we had a selection of excellent films to watch on our in-room TV. The ship docks daily at one, and sometimes two, ports and Ama offers passengers daily complimentary tours. Bicycles are also available. If you choose the Tulip Time Cruise itinerary (available in springtime only), tour highlights are visits to the dynamic cities of Amsterdam and Brussels, classically beautiful and romantic Bruges and the resplendent flowers of Keukenhof Gardens. In both Amsterdam and Bruges, a half-hour canal cruise was included on guided tours at no extra cost. In addition to having a tour leader, passengers are provided with a Quietvox battery-operated listening device with an ear piece that enables walkers to follow the narrative without being next to the leader. Self-select to take a yellow (normal pace) or pink "gentle" (i.e. slow walkers) tour. This writer, who tends to dawdle, is by speed and temperament a salmon. More than once I inadvertently picked up another guide's spiel on the device and ended up walking off with a different group — yet I always found my way back. Some smaller ports are charming and surprising. Arnhem, for example, is where the wartime drama depicted in A Bridge Too Far actually took place and the RAF parachuted into the Netherlands to fight the Nazis. From the 17th-century until the death of Queen Wilhelmina in 1962, Het Loo Palace was where House of Orange-Nassau royals lived, loved and hunted (Prince Hendrik was said to be as avid a stalker of local women as he was of game). Less grand and gilded than Versailles, it is nonetheless elaborately decorated and contains extensive stables and gardens. And it's not unusual for an exhibitionistic peacock to greet visitors with a furl of feathers. Admission grants ingress to the gardens and house, with its many rooms designed for gathering, sleeping, eating, gossiping, and no doubt planning strategy and savoring conquests. The pièce de résistance destination on the Tulip Time cruise is Keukenhof Gardens outside of Amsterdam. We were fortunate to visit the 70-acre park on a resplendent spring day. Despite it being crowded, the gorgeous plantings took our breath away. Planned and planted with the skill of artists, Keukenhof impresses with brilliantly colored beds of single- and multi-color flowers, primarily tulips. Inside pavilions feature flowering bulbs, cut flowers, pot plants and shrubs. In the Oranje-Nassau pavilion, tableaux inspired by Vincent Van Gogh paintings were enhanced by live flowers. See the Keukenhof windmill, sail on one of its canal boats, shop for cheese or wooden shoes, pause for an ice cream or Belgian waffle or simply revel in the sun, the scenery, and the scents. It's the nature of a slow-moving river cruise that some ports will be more exciting than others. Yet all offer a good excuse to get off the ship, explore at your own pace and shoot photos. Willemstad's claim to fame is its church organ, and a number of the passengers visited to attend a concert of the pipes. Windswept and tourist-thick Volendam made us want to hurry back to the ship... and Edam, with its singular cheese shop, curdled our desire to explore that particular destination. Bottom line: This is your vacation. Pack a good book or two, and don't feel obligated to get off the ship at every port simply because it ties up there. Could the Tulip Time Cruise be Improved? We can't imagine more relaxing days than the ones we spent aboard AmaCerto. Still, there were minor aspects that failed to impress. Plastic flowers! On a voyage to visit the magnificent Keukenhof Gardens, we were shocked to see bogus buds on the ship. As days went by, fresh tulips made an appearance, but those infernal plastic ones remained. Art. In place of generic abstractions, we would have loved to view gorgeous photos that related to the itinerary. Ones made at Keukenhof Gardens, for instance, would help to imbue cabins and public spaces with a sense of place. Noise. It didn't happen every night, but when the ship sails fast, the waves are rough and it's particularly windy, cabin walls creaked. Add on-board enrichment. We would have liked a bit of intellectual stimulation. Given that many of the destinations had long histories and some were pivotal during World War II, we hungered to know more than what our tour guides could provide in limited time. Is an AmaWaterways River Cruise Right for You? A river cruise may not appeal to young, high-energy honeymooners, but baby boomers and older couples are likely to appreciate it. Note: AmaWaterways has announced a partnership with Disney to break into the family-travel market. The 170-passenger, purpose-built AmaViola and Adventures by Disney partnered to offer voyages that deliver specially designed on-board and in-port activities geared towards kids, teens and adults. Regardless of which ship you sail, AmaWaterways takes care of passengers every step of the journey. Representatives can meet you at the airport and lead you and your luggage to a private transport that will take you directly to the dock where the ship is berthed. Staff on AmaCerto was impressively kind, solicitous and patient. One fellow cruiser called the ship a "nanny state;" to me, it was heavenly. When I was on the empty Sun Deck, dipping my toes in the warm pool and a waiter arrived to ask if I wanted a drink, I was pleased to be catered to. And the sweet, concerned chambermaid, who straightened the daily cyclone I left of my room and sympathized when my hair was a fright and offered her limited free time to help me fix it, well, you can't train people to be this kind and thoughtful — you can only hope to hire them.